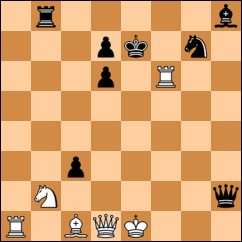 bxa1=Q and Black wins (if 5. Ra4 Qh1+ and Black wins; if 5. Rf8+ Kxf8 6. Qxd6+ Kf7 and Black wins). If 2. Rf1 Qh4+ 3. Rf2 cxb2 4. Qe2+ Se6 and Black wins. But 1. … Qg1+! 2. Rf1+ Qxg5 3. Qe2+ Se6 and Black wins. If 2. Ke2 Rxb2+ 3. Kd3 Qxg5 and Black wins.